This course sets the foundation for the behind-the-wheel driver's training and is accordance with the guidelines set by the Department of Motor Vehicles. Our Certificates are DMV approved. 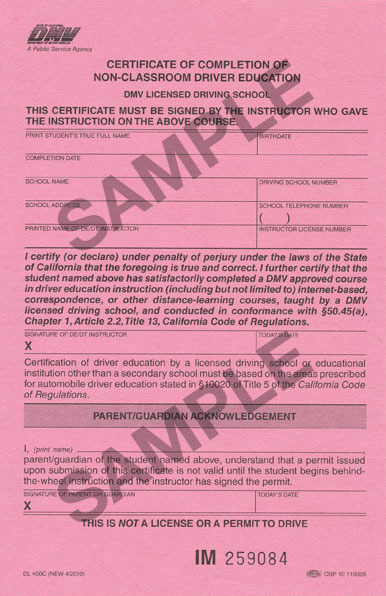 Course content complies with the provisions of the Vehicle Code Section 12814.6. Complete program is written and reviewed by Professional Driving School Experts. The course is designed with hundreds of photos, animations, videos, quizzes, and illustrations to help students enjoy the experience, understand the material, and become better drivers. driving distractions and much more.